News – Page 2 – PELI Glass Products B.V.
Do you need lead came from our catalog, one that you don’t use too often, where 25 kg would be too much? 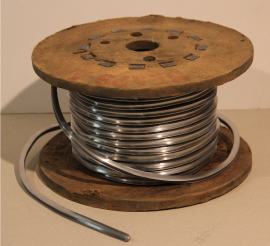 We can offer you lead came on a small wooden drum, for quantities to approximately 7 kg (15.4 lbs). A client visited us last month and we were discussing painting on float glass. Peter mentioned that it was possible to check for the tin side of float glass with a drop of water. It’s true! You don’t have to use a UV lamp. Float glass (normal window glass) is made by floating the glass on top of a molten tin bath. The side of the glass in contact with the tin bath picks up residuals from the tin and this will have an effect on your silver stains and may have an effect on your other glass paints. Best to check the glass before painting and plan accordingly. It seems strange to think that there’s black, blacker black and blackest black. It’s hard enough to say, let alone think about! But which is the blackest paint for glass? Should I stretch lead came? We have built a “Directory of glass-related courses” so you can find help for glass-related techniques anywhere in the world. It is absolutely free for your studio or school to have a listing and it is also free to view it and find studios, schools and courses. With 4 hardnesses within the Heaps line, how do you know what to select?